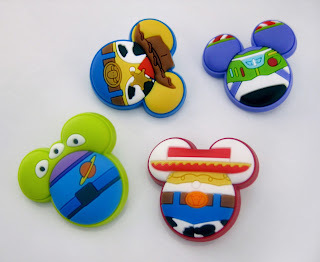 The MagicBandit collection continues at Walt Disney World with this brand new set of four, this time featuring Mickey Mouse shaped "Bandits" inspired by the designs of Toy Story's Buzz Lightyear, Woody, Pizza Planet Alien and Jessie! 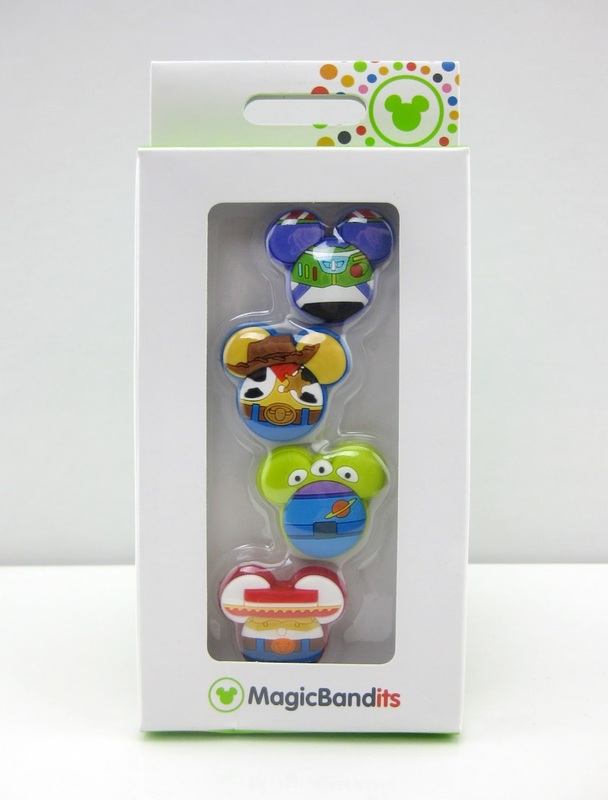 This is the second set of Toy Story themed MagicBandits, following THIS 3-Pack released in 2015. If you've never heard of "MagicBandits", here's the scoop. 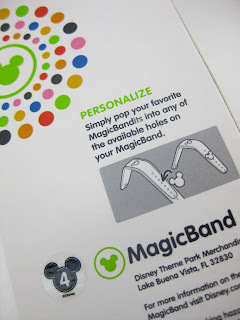 They're basically just little vinyl charms that snap into the extra holes of your magic band (check out the back of the package below) to add additional pops of color and personality. Many different Disney characters and icons are available! I love showing off my love for Pixar while in the parks. 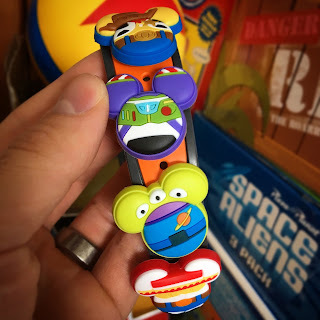 The first Pixar Bandits I ever saw in the parks were the Monsters Inc. ones back in 2014, which sold me on the idea of collecting these things. I thought it would be fun to add some of my love for Pixar to my magic band and my overall "ensemble". After finding those, I was hooked and looked for more Pixar related Bandits. I then found a fun Cars 3-pack and then found out there was a rare/sold out Incredibles 4-pack (which I got online once I got home from that trip). In 2015, the aforementioned Toy Story themed 3-pack was released as well as a Finding Nemo 3-pack. The Up 3-pack was the latest I got before this one. At this point, I'll be able to wear a different Pixar movie on each day of our next Disney World trip! You may be wondering if these stay on well. Yes, for the most part. Once you pop them on, they're pretty secure. 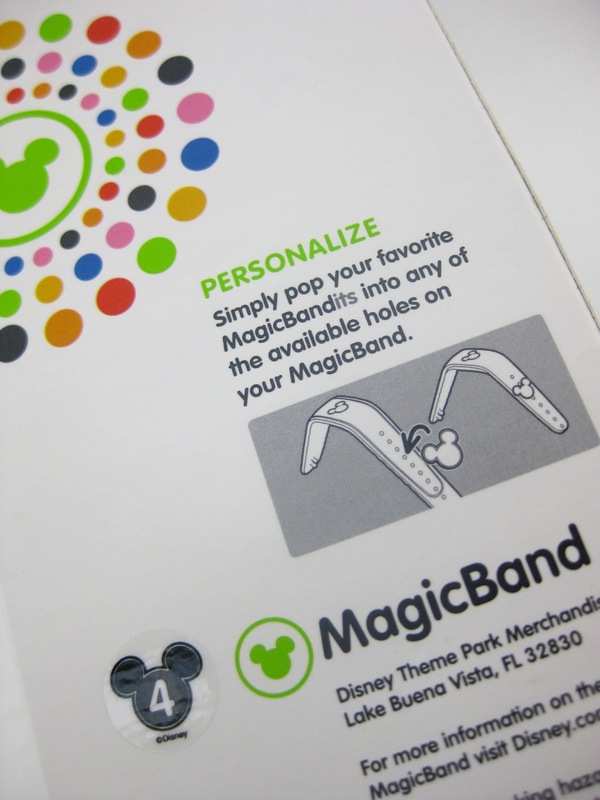 They can snag on things, however, and pop off (I had that happen once or twice, for example getting off of Rockin' Roller Coaster). For adults or older kids, you won't have to worry about them falling off too much. Getting these for young kids though may be a different story, since they could easily rip them off and toss them aside. I definitely wouldn't get them for kids under six or seven, but it totally depends on the kid of course. Just in case you do plan on getting these Bandits for very young kids, be aware that they may easily be snagged on something or pulled off and lost. Follow me on Instagram @danthepixarfan! A Bug's Life: Funko "POP!"